Not much to report, but I noticed that I last posted a week ago so I thought I would check in with y'all. We are back from our trip over the mountain to visit my in-laws. We had a great time eating and loafing around. I managed to finish one book and catch up on my magazines too. I was so happy to see that my car was no longer buried and I could actually get it out of my driveway. We are now back to our regularly scheduled rainy Oregon weather which is just fine with me. Time to put Christmas away. A job that always makes me a little sad, but it will give me a chance to do a little rearranging too. A couple weeks ago we got a letter from the Home Owners Association in our neighborhood stating that I could not use my front porch to store furniture. What the heck? Well, I guess I was surprised that I didn't get a letter sooner. So, I finally cleared off the excess furniture on my porch and I have to admit, it does look quite a bit better. Hopefully they won't take issue with the furniture I am using to "decorate" my front porch. This is the last week the kids are home from school. I'm sure by the time they go back, their brains will have turned to mush. Three weeks off from school is just too long if you ask me, but I have say that I have enjoyed a lot of lazy mornings these past few weeks. Heading over to Monticello tomorrow for a much needed re-stocking/re-arranging. I have a pile of stuff ready to go. I guess with all the snow it has been a little quiet over there, but now that the weather is better, hopefully people will be coming out to shop. Cindy, has invited everyone to do a "Year in Review." As usual, I am late to the party. 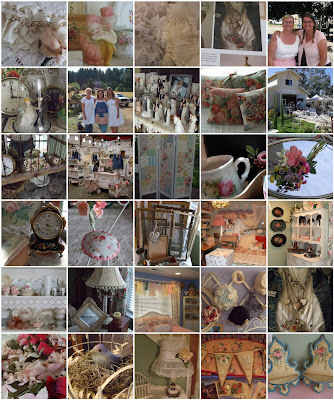 Here are some of my favorite pics from my 2008 blog posts. They are kind of dinky and hard to see. You can click on them for a better view. Hope you all have a wonderful Tuesday! Beautiful pictures Lisa! I have enjoyed visiting here all year long!! Have a wonderful New Year with lots of laughter!! Love your mosaic photos! I've enjoyed your blog this year, and look forward to more in 2009! Love your porch. I am definetly feeling porch envy. I am visiting via the links from Cindy at My romantic home. Those are gorgeous photos so better late than never!!!! I'm glad to hear the snow stopped up there. It's warmed up a little bit in Northern California too! I wish you a happy New Year!!! Your porch looks cute! You need to print off all these comments about the porch and send them to the home owners and say ...seeeeeeeeeeeeeeeeeee.....you don't know nothin about style! Happy New Year Lisa! I totally have enjoyed visiting you all year. I could live in your mosaic - oh, I love all your gorgeous photos. I do hope to maybe meet you in 2009 since we have a couple trips planned down your way. Hopefully Farm Chicks too... Here's to a fabulous 2009! I'm very late to the party, but I hope you'll stop by! Love all of your home decor! Your mosaic is beautiful...love all the shots you included. I have really enjoyed your blog, and look forward to your etsy! May 2009 bring you health and happiness. It looks like you had a beautiful year, love the screen! Have a wonderful New Year. Happy New Year-I'm so glad we *met* in 2008! I love the collage-it is so fun to see how we all like the same things but put our own twist on them! Have a great weekend before *real* life sets in again! Happy New Year Lisa! 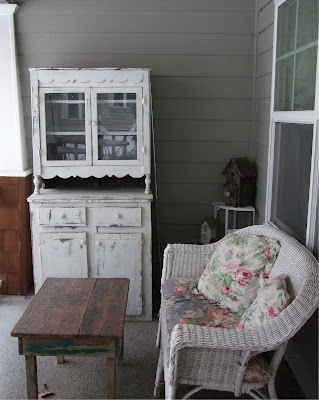 Your porch is just so so cute with that cupboard on there. Beautiful pictures. I love pink and roses. And there are a lot of it here. I love your porch. Happy 2009! I just love thrifting with you. You find such wonderful items. Your front porch looks great now. That buffet you found is very nice. I can picture you working your magic on it. Can't wait to see how it turns out. You got a whole lot of snow. Sheesh!